The Technics relaunch is well timed. With high resolution audio finding genuine traction (when Iron Maiden remaster their entire back catalogue you know things are moving in the right direction), there are tangible benefits to be had from reinvesting in classic stereo separates like these. Minor caveats aside, I rate the C700 a luscious example of hi-fi luxe. The Premium C700 system is the first Technics branded hi-fi system to be launched in seven years. The hi-fi brand, which was lauded and loved throughout the Seventies and Eighties for its turntables and silvery separates, was retired by parent Panasonic during a corporate cleanout and thought consigned to the car boot of AV history. However it now lives again, fuelled by the inexorable rise of high resolution audio. The C700 Series reviewed here comprises three unapologetically expensive components: the £1249 / $1,600 SU-C700 stereo amp, £849 / $1,100 ST-C700 network audio player and £1199 / $1,700 SB-C700 compact speaker system. There's also a matching CD player, the SL-C700, if you fancy it. While you can mix and match with other brand components, that's not advisable. This system has been designed to perform as an ensemble. Build quality across the range is superb. You get the sense that these components will look as good in 2025 as they do today. The cool retro cosmetic design is a real winner. The digital amp is not particularly large, measuring just 340 x 131 x 324mm (w/h/d). Naturally the fascia features characteristic illuminated VU meters (how could it not? ), with a central volume dial. 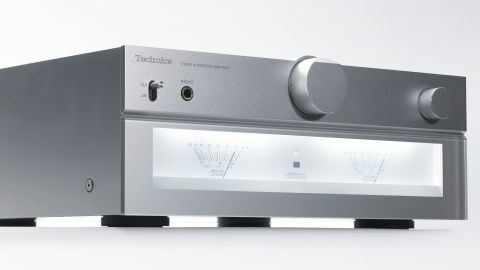 Rather than opt for a common–or-garden switch-mode power supply, Technics has gone old school with a low-noise, high-capacity linear power supply. This is a pleasing indulgence. The amp tips the scales at 7.9 kg. Connectivity comprises six digital audio inputs (three optical, three coaxial), one pair of stereo phonos, a MM phono input for born again vinyl junkies and a USB-B connection for laptop hook-up. The matching ST-C700 network audio player features a central display, offering white text on black. There's no album artwork displayed when browsing, which seems overly frugal. Connections here include both USB-A and USB-B inputs, plus two digital audio outputs (coaxial and optical) and a stereo phono pair, plus an Ethernet LAN. There's also a DAB+ and FM radio tuner onboard, along with aptX Bluetooth support. The ST-C700 network audio player has been seriously over-engineered to reduce the spectre of digital noise. One cool trick is Virtual Battery Operation, designed to reduce noise and trace distortion generated by the power supply. There's also a high resolution iteration of Panasonic's Re-mastering technology. Given such audiophile obsession with noise management, it's no surprise to find Wi-Fi AWOL. The compact curvy SB-C700 speakers feature a piano white finish. While magnetic grilles are supplied, the flush-mounted coaxial driver is so pretty it seems almost vulgar to mount them. The speakers are rear-ported, with chunky binding posts. Charged with delivering crisp highs is a 19mm aluminium diaphragm dome tweeter, rated up to 100kHz; it's allied to a flat 160mm woofer. System setup is a breeze. It's merely a question of connecting the components together and getting the system onto a network. When powered up, the player looks for DLNA servers on the network. These can then be navigated by a basic tree and root structure. Both units ship with the same remote, which drives the ensemble. Only one is required. I suspect though that many will ditch the zapper and choose to drive the system from the Technics app, which is intuitive and graphically rich. The SB-C700 speakers are best placed forward facing, rather than toed in; the stereophonic spread is pronounced. Cabinet colouration appears non-existent.